The vulture is a very powerful totem. Its cycle of power is year-round. If you have a Vulture as a spirit guide or totem, it can show you how to use energy powerfully and efficiently. It glides effortlessly on the winds, soaring to extraordinary heights while using little or no energy. 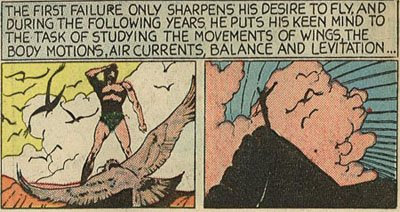 The Vulture skillfully employs already existing air currents against the pull of gravity, symbolizing the distribution of energy so that gravity (or cares) do not weigh it (you) down. In the process the vulture does not use its own energy, but the energies of the Earth instead, the energies of the Earth --- or the Natural Order of Things --- being ONE of the mainstay sources in The Power of the Shaman. A very valuable lesson. "One day, when I was around ten years old or so, I went for a hike deep into the desert unescorted. When my Uncle discovered I was gone he went looking for me. During my walk I happened across the carcass of a dead rabbit and was fascinated by it for some reason. When my Uncle found me after cresting a small hill he saw me squatted down with the carcass. Joining me quite comfortably in a circle with the rabbit were three what were, because of this incident, to eventually become my Totem Animal --- VULTURES. From what he was able to discern from his initial vantage point I was neither afraid of them nor were they remotely afraid of me. As well, and he swore this to be true --- although I have absolutely no recollection of it and construe it as a possible total misinterpretation of facts --- that the vultures and I were sharing meat from the carcass between us. The scientific name for the Turkey Vulture is CATHARTES AURA which means GOLDEN PURIFIER because as it goes about it's lifetime business it purifies the landscape and environment in it's own natural way, ensuring the continued health and life of other living things. The Vulture is a promise that all hardship was temporary and necessary for a higher purpose. Once a Vulture enters your life as a totem or guide, it will remain with you for life. 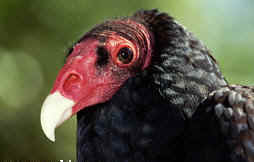 Unlike the needs of nearly all other living creatures, vultures do not kill. Their prey either dies or something else kills it. Truly a most noble attribute for any living entity, flora or fauna. Herodorus Ponticus relates that great men of legend were always very joyful when a vulture appeared upon any action. For it is a creature the least hurtful of any, pernicious neither to corn, fruit-tree, nor cattle; it preys only upon carrion, and never kills or hurts any living thing; and as for birds, it touches not them, though they are dead, as being of its own species, whereas eagles, owls, and hawks mangle and kill their own fellow-creatures. That very same overall innate nature imbeded in the actions and life of the vulture, never killing or hurting a living thing or its own fellow creatures, is reflected for the most part, in and by the the actions and life of the person that truly has the vulture as a totem animal. The noted Athenian writer Aeschylus (c. 525 BC-456 BC) says,- - "What bird is clean that preys on fellow bird? - Besides, all other birds are, so to say, never out of our eyes; they let themselves be seen of us continually; but a vulture is a very rare sight, and you can seldom meet with a man that has seen their young; their rarity and infrequency has raised a strange opinion in some, that they come to us from some other world; as soothsayers ascribe a divine origination to all things not produced either of nature or of themselves." Be as it may, the Assyrians, Greeks and other early civilization city-states were actually late comers to the use or representation of vultures in ritual, religious, or shamanistic rites. In the 1950's the husband/wife archaelogist/anthropologist team of Ralph and Rose Solecki began excavating a cave site 250 miles north of Baghdad along a tributary of the Tigris River called the Greater Zab that rises out of the Turkey-Kurdistan border area. The cave had been used for burials by an ancient tribal people called the Zawi Chami around 8870 BCE (plus or minus 300 years, according to carbon-dating) --over 10,000 years ago-- which is well over 4,000 years before the beginnings of any of the various cultures mentioned above. In their dig the Soleckis found a number of wing bones of large predatory birds, which turned out to be Gyptaeus barbatus (the bearded vulture) and Gyps fulvus (the griffon vulture). "The Zawi Chemi people must have endowed these great raptorial birds with special powers, and the faunal remains we have described for the site must represent special ritual paraphernalia. Certainly, the remains represent a concerted effort by a goodly number of people just to hunt down and capture such a large number of birds. Either the wings were saved to pluck out the feathers or they were used as part of a costume for a ritual. One of the murals from a Catal Hayuk shrine ... depicts just such a ritual scene; ie, a human figure dressed in a vulture skin"
"Shamanism is a system of belief common to the Turks of Central Asia. Both men and women could be Shaman priests and among old Turkish groups they were called Kam. Kams dressed in elaborate garments to display their supernatural powers. Accompanied by the beating of drums in their rituals, they believed they could fly with the aid of their own guardian animal. During such flights they reached various levels of Heaven or the Underworld. Upon returning to this world, they used the information they had learned during their journey for the benefit of their followers". "Each place and location has its own power and potency. By raising our consciousness about the geo-cosmic specificities of gravity, light, magnetism, solstices, equinoxes, lunar cycles, indigenous plants, animals, climate, and so forth in any given area, we can come to value the variety of diverse cultures and regions whose multiple knowledges all serve to enhance life everywhere on our planet. Most of these geo-cosmic teachings can only be acquired in the particular region in which they occur. If we are to awaken our own Shamanic abilities, perhaps lost in the mist of time, then we must attune ourselves to precisely those same forces as they manifest themselves in our own bio-regions. In some cases this may require us to learn about our region from the indigenous tribes in our area; in other cases we must set about discovering the power of the places in which we live on our own. We need not run away to other "exotic' cultures, but begin exploring our own backyards." Dangerously perched for the second or third time from a highly angled prone position on the edge of Fajada Butte --- the lonely 400 foot high core remnant of an ancient mountain rising from the floor of Chaco Canyon and home of the sacred Native American solar calendar called the Sun Dagger --- for no other reason than pure curiosity or an adrenaline high, I began watching three vultures lazily circling at about the same height across the valley ... and scary or not, to drop a few rocks over the edge as probably any ten-year old boy might be expected to do no matter where they were. 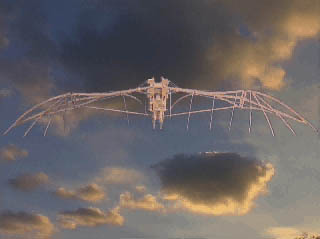 The three vultures were soon joined by a fourth and in my mind I thought how cool it would be to have the Da Vinci glider my uncle and I had built and launch it from the cliffs and join them. The group was slowly moving away, drifting south and higher on the thermals. One of the four, whether it was the new one to the group or not, widened its circle flying incredibly close to where I was on the ledge, so close individual feathers could be seen and it seemed, but not probable, eye contact made. The vulture circled around toward the group. Thinking there might be a second pass I waited, but in the process of the flight, somehow lost visual contact. The vulture group continued to drift south, but now distinctly with only three members. With no sign of the bird returning I decided to inch my way back away from the ledge toward the ruin entrance. In a slow turn while rising to my hands and knees in order to scoot back inside where it was safe to stand, I caught what was nothing more than a fleeting glimpse of what seemed to be a person, almost shadow-like, not my uncle or the elder, but possibly a woman, along the ledge several rooms down. Covered with goose bumps and scared out of my mind I scrambled into the ruin and hid in the corner of the crumbling half-height wall in such a fashion that if a person did pass by they would be unable to see me. I glanced slightly over the wall and could see that it would be easy for anybody to recognize that the ground-surface of the ledge between the ruin and the edge had been disturbed quite recently by a someone or something going in and out of the structure. I decided to hop the wall between the rooms thinking that if someone did come into the room and see the backpacks and equipment they might think whoever owned the stuff was out on the butte and just leave. I raised up in a half-crouch to slip over the wall into the other room when I was confronted by a woman on the other side. At first glance, in the shadow of the cave, backlit with the bright blue sky, she looked like an old lady with long white hair and wrinkled face, but as we both moved to strengthen our positions I could see surprisingly, she was not old at all. Her face was smooth and young and her hair long and black, the whiteness I thought, apparently caused by the brightness of the backlit sky. She carried a small pouch-like bag tied at the top in the palm of her hand. With her thumb and the first finger of her other hand she spread the top open and stuck in two fingers, pulling them out covered with a fine white powder. For some reason I was no longer scared, I even leaned forward as she put her hand out as though she wanted to touch my face. She put three marks across my forehead two fingers wide, each time returning her fingers to the pouch to replenish the powder. She also put what felt like cresent shaped marks on my cheekbones starting at the top of my nose and going outward toward the bottom of my ears. She also put one downward on my chin. She then turned and walked away. When she reached the exit she turned back for only a moment, shaking out the pouch much like one would shake out a handkerchief, the wind coming through the portal catching the dust and swirling it into a white cloud. In the second the dust took to dissipate she was gone. The Egyptian Goddess Maat is usually depicted with the wings of a Vulture. Maat is the personification of the order of the world. She and her totem represented the norm of things, the way the universe worked, the conduct of its creatures. They represented morality, justice, social and cosmic order -- the balance and harmony of the universe. 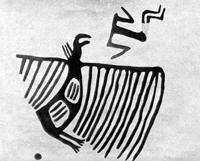 To the Pueblo Indians, the Vulture was the symbol of purification. Its medicine would restore harmony to that which had been broken. They used Vulture feathers for grounding during shape shifting ceremonies to make sure that they would return to their own body and mind. The Vulture also dispelled evil, discharm objects and recover slain warriors. In alchemy, the Vulture is the symbol of sublimation. The confirmation of the relationship between the volatile aspects of life and the fixed aspects of cosmic and psychic forces. People with Vulture totems often can see auras and colors around people and things. The Vulture can see the thermals rising from the earth and uses them to soar into the sky. The Vulture can also teach you patience. It will soar for hours, high in the sky, using the air currents. One quick thing before moving on. It must be remembered, having a vulture as totem is not the same as being a Vulture Shaman any more than having a bear as totem would make you a Bear Shaman. Some people confuse the issue. There is a big difference. For one thing, just because you have an animal totem as a spirit guide does not mean you are a Shaman or a Shaman of that particular animal. For example, Salvador Lopez, a member and highly revered spiritual elder of the Cahuilla band of Indians and thought to be one of the teachers of Carlos Castaneda, was said to be a special class of Shaman called a Bear Shaman, Shamans who have received their power from grizzly bears and who possess many of the qualities of the grizzly, especially their apparent invulnerability to fatal attack. However, nowhere was it ever said his totem animal was a bear. In the earliest of times, the sun lived very close to the earth - so close in fact that life upon the earth was becoming unbearable. The animal world got together and decided to do something about it. They wanted to move the sun further away. The fox was the first to volunteer, and he grabbed the sun in his mouth and began to run to the heavens. After a short while, the sun became too hot, burning the fox's mouth, and he stopped. To this day, the inside of the fox's mouth is black. Then the opossum volunteered. He wrapped his tail around the sun and began running toward the heavens. Before long though, the sun became too hot, burning its tail, and he had to stop. To this day the opossum has no hair upon its tail. It was then that vulture stepped forward. Vulture was the most beautiful and powerful of birds. Upon its head was a beautiful mantle of rich feathering that all other birds envied. Knowing that the earth would burn up unless someone moved the sun, the vulture placed its head against it and began to fly to the heavens. With powerful strokes of its wings, it pushed and pushed the sun further and further up into the heavens. Though it could feel its crown feathers burning, the vulture continued until the sun was set at a safe distance in the sky away from the earth. Unfortunately, vulture lost its magnificent head of feathers for eternity. One of the seven of the Seven African Powers as found in Orisha and Obeah is Oshun, also associated with Ibu Kole, the vulture. It is said in ancient days Oludamare/Olofi became disgusted with humans and their behavior, turning away from their needs and prayers. Resources were depleted and famine spread throughout the world. As far as Oludamare/Olofi was concerned the human race could end forever. Because vultures fly higher than any other winged bird, Oshun transformed herself into the form of a vulture in order to fly to the heavens and intercede on the behalf of humans and save her children. Olodumare was so compelled by such spiritual virtue that he fulfilled her request. One day when Trickster was walking about with no particular destination he heard a shriek from above. When he looked up, there unexpectedly was a very large bird headed right for him. It was a Turkey Vulture (cathartes aura). When it got near, Trickster said, "Well, younger brother, you are certainly lucky to be able to fly around and have such a good time! 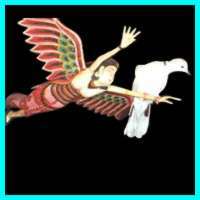 I wish I could fly like you. You could carry me on your back, if you had a mind to, for I like the way you do things, that is why I say this." "All right," said the Turkey Vulture, "you can climb on my back." So Trickster mounted up, but the bird had to exert itself mightily to get airborne, indeed it had to use all its powers to leave the ground. Finally they were soaring high in the air, and Trickster was full of enthusiasm, "Indeed, my younger brother, this is a fine time we are having. It is very pleasant to fly about like this." Then the vulture dipped his wing and peeled off so that it was all that Trickster could do to hang on. He shouted, "Be careful! When you fly like this I could fall off!" So the vulture righted himself and glided as he had before. Trickster was once again happy and chattering about how much he was enjoying himself. Now this vulture knew full well what sort of man Trickster was, and how he acted; so he decided to give him a little of what he had been giving others. He circled about until he came directly over a hollow tree without a single branch; then, suddenly, he pitched violently when he was over the tree, and Trickster fell right into the hollow. "Alas," cried Trickster, "what an evil thing to do. You have turned the tables on me!" 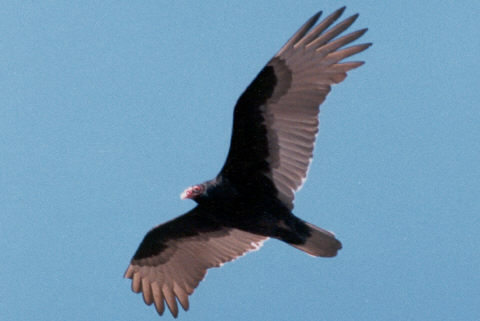 Thus the Turkey Vulture had tricked the Trickster, one of the few creatures in all of Native American lore to have the "power" and guile to one-up the Trickster. Kamship is an important part of the pre-islam Turkish belief system. Kam, Kaman or Shaman leads several ceremonies for communicating between this world and the world of sprits. They also lead several rituals for birth, death and marriage, the periods of transitions. They fight against bad sprits with their symbolic knives or wooden swords. The wooden sword, representing the justice, is a symbol for the peaceful solution of disputes. One can not learn kamship, instead one should descent from the family of a kam. It is believed that the sprit of the grandfather passes to the grandchild, this is very similarly observed in dedeship in Anatolia. My uncle's wife was a powerful curandera in the tradition of 'la Catalina,' and like 'la Catalina,' held in awe by most that came within her presence. Tall and straight-backed, with perfect posture and beautiful skin, instead of taking steps she appeared to almost glide when she walked. In restaurants and public places people were reluctant to sit near her table and the help was afraid to serve her. Some have said they had seen a glass of water slide across the table to her hand without her even moving her arm. Upon hearing the story regarding myself and the vultures she was certain, at least as she viewed it from her own perspective, that if my uncle had not come across the the circle when he did I would have flown off with them, or, if not then, the six-foot wingspan raptors would have carried me off with them as if I was one of their own (again, her perspective). Years later my uncle told me something he had never told his wife nor discussed with me. The distance I traveled that day, from the point I started to the location he found me, was way to far for me to have covered given the time, especially considering the level of my own abilities, the terrain, heat of the day, etc. He told me he had tracked me some distance quite clearly, then my tracks suddenly just ended as though I had disappeared into thin air. Knowing I didn't have a large supply of water or any at all he continued to look in areas he thought I might seek out and just happened across me --- many, many miles from where he had last seen my tracks. How I got there he couldn't say with any amount of certainty. However, he told me, and he kept it a secret from his wife even to the point of burning my shirt, that my shirt below both shoulders as well as part way down the back and along my sleeves were punctured in spots and appeared to have what he called grip marks on them. So too, my skin had red abrasions almost like minor scratches as though my arms had been clutched by something. He told me he was sure I had been carried off and if he hadn't happened across me I may had been carried off even further, maybe even never to be found. In that my uncle was not able to get me to tell him verbally --- OR I was unable or unwilling to put into words my experience of what happened that day --- my uncle suggested I sit down and draw whatever pictures came to mind that related to the event. All of those drawings are long since gone as are any finite memories of same, except for one. I remember it clearly as if only yesterday because of the striking comparison my uncle made between one of my drawings and an ink and watercolor drawing by Leonardo Da Vinci. They were nearly identical, desert landscape and all. 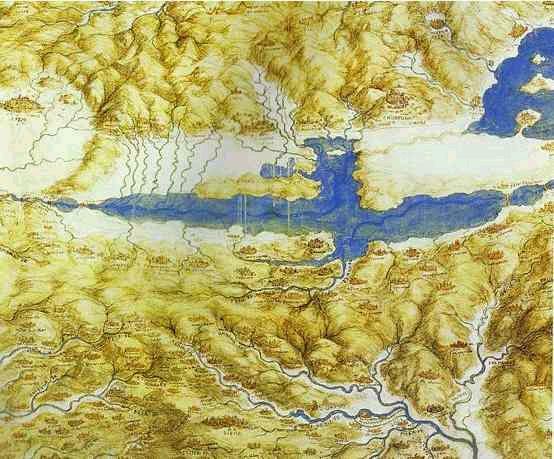 The major exception was that where Leonardo's drawing depicted a lake with a shape similar to a bird, my drawing, although having a similar shape, was instead, a SHADOW of a giant bird. Leonardo Da Vinci: Bird's-Eye View of a Landscape. 1502. Why all the fuss about giant flying creatures, giant birds, and giant feathers, and all somehow and in someway related back to the Wanderling? Basically, the Wanderling's uncle stated many times that he felt the reason for his destiny and fascination regarding all aspects of giant flying creatures went back to an incident that involved the fly over of a giant airborne object that the Wanderling witnessed as a young boy. The object, of an unknown nature and an unknown origin, was seen by literally thousands of people along the coast of California barely three months into World War II. Eventually to be called the Battle of Los Angeles, the incident is mostly forgotten now. However, during the early morning hours of February 25, 1942 the whole city and surrounding communities were in an uproar as thousands of rounds of anti-aircraft shells were expended in an attempt to pull down whatever it was in the sky that night. The slow moving object, said to be as big or bigger than a Zeppelin, was caught in the glare of the searchlights from Santa Monica to Long Beach and seemed impervious to the the constant barrarge of shells. It eventually disappeared out over the Pacific after cruising along the coast and cutting inland for a while. The huge object was never clearly explained and was basically hushed up without response from the authorities.